Many of our students have been working hard to develop robots. 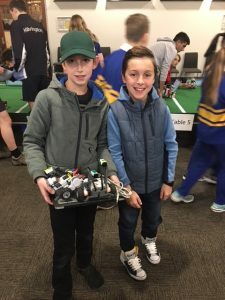 They have programmed their robots so they can go through an obstacle course to perform a rescue, or perform a choreographed dance routine or autonomously play a game of soccer. Now it is crunch time and they will be competing against different schools (Secondary and Primary) using different robots. Last week some of these students were at Sacre Coeur showing off their dance and soccer robots. All teams performed extremely well. This weekend other students will be at St Michaels with their rescue robots. All robotics teams created some memorable moments. None more than the Soccer Team ‘The Beasts’ (Marko, Xavier, Massimo), when they beat the Australian Champions 2 – 0. Over the next couple of months our teams have the opportunity to compete at the State and the National level. As always our students were wonderful sports, and received exuberant support from our wonderful parents.